Map of the Soquel Creek Water District service area. 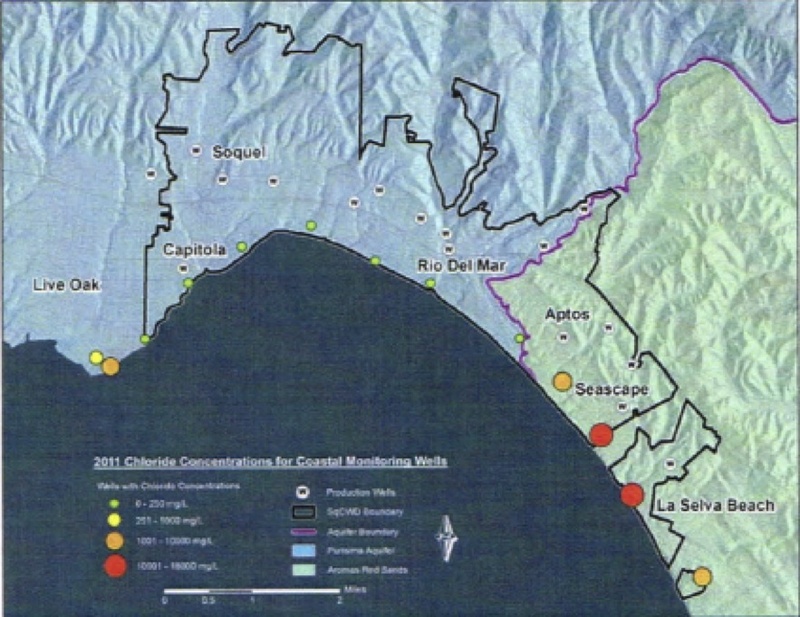 The orange and red dots illustrate high chloride levels in monitoring wells, an indicator that seawater intrusion is occurring at our coastline. The District relies entirely on the Soquel-Aptos Groundwater Basin for its water supply which is over-pumped and experiencing seawater intrusion, a condition that allows seawater to enter and contaminate the groundwater supply. Once it reaches our drinking water wells or those used by others, it makes the water supply unusable. To prevent this seawater from continuing to move inland, the District needs to reduce our overall groundwater pumping by 35 percent for at least 20 years to allow the basin to fill up again. The District has been evaluating a joint seawater desalination project with the City of Santa Cruz since 2007 but is also exploring back-up options. “We can’t wait much longer for a solution to our groundwater shortage, and we want our customers to know that we are moving forward to finding the best long-term options,” said District General Manager Kim Adamson. The District’s intent is to shortlist and select a back-up option(s) to the joint scwd2 Regional Seawater Desalination Project should that project no longer be considered. For more information, visit http://www.soguelcreekwater.org/exploratory-discussions. These meetings are being recorded by Community TV of Santa Cruz County for playbacks on their government/public affairs channel 25171.